The primary focus of the information on this website is the history of the U.S. M1 carbines used by Germany after the war. German use of the M1 carbine during the war has stimulated a fair amount of interest and, more often than not, is based on a series of photographs that are not what they appear to be. Courtesy of the Nazi propaganda efforts. A web page devoted to this topic and discussion of all of the material discovered so far, can be viewed at the link below. Germany is roughly 137,847 square miles. It is smaller than Montana, but larger than New Mexico. On V-E Day (Victory Europe Day), spread throughout Germany, were over 1.6 million U.S. troops organized into 59 divisions, 15 corps, 5 armies, and 2 army groups. In American custody, there were over 6 million enemy combatants that needed to be processed and war criminals identified. Hundreds of thousands of Allied prisoners of war were being released and repatriated. There were over 2.5 million displaced persons (DPs) that had been moved around Europe as forced laborers, and were now wandering homeless throughout Germany like gypsies. These, and other refugees, former political prisoners, and concentration camp survivors added to the crushing demand for food, clothing, and shelter. Add to this the German population of approximately 13 million, many of whom were also in need of the basic necessities for life. Most of the major cities in Germany had sustained significant damage. Water, electricity, fuel for heat, and food were in very short supply, and working telephones were virtually non-existent. Germany's politically administrated infrastructure and support system had totally collapsed. To understand the history of the U.S. M1 Carbines used by Germany after WWII, and interpret the markings on these carbines, it is necessary to understand the Allied Occupation in general, the American Occupation Zone specifically, and the U.S. Office of Military Government (OMGUS) as they related to rebuilding the German political infrastructure and law enforcement. The London Protocol between the Allied Governments, signed on September 12, 1944, declared that at the end of the war, Germany would be divided along historical and political boundaries into three occupation zones, one each for the United States, the Soviet Union, and the United Kingdom. At the Crimean (Yalta) Conference in February 1945, it was decided that France would be given an occupation zone from portions of the American and British zones. On the day the war ended, Allied Forces were spread all over Europe, and it took a number of months for them to relocate into their respective zones of occupation. During this time period, military government and policing continued to be handled by SHAEF's G-5 Division, which prepared the American Occupation Zone for transfer to the control of the U.S. Office of Military Government (OMGUS). The commander of the military forces in each of the four occupation zones was designated that zones Military Governor and the sole representative of his nation on the Allied Control Council, the committee responsible for all of Germany. With the exception of Berlin, each territory (Land; and comparable to a U.S. State) was comprised of two or more political and geographical districts (Regierungsbezirke). Each district was made up of numerous, smaller Kreise (equivalent to U.S. counties) and Städte (cities). For the purpose of re-establishing the German government, including police forces, the U.S. appointed five Land Military Governors, each with his own Office of Military Government (OMG). Each governor was subordinate to the overall commander of U.S. military forces in the American Occupation Zone, and separate from the chain of command for the American military forces stationed in each Land. Operationally, the two U.S. commands (government and military) within each Land worked side by side. The U.S. Army Ordnance Department was charged with examining, inventorying, and disposing of the German and Axis weapons. To accomplish this task, Ordnance established a central weapons control/processing center in each Land. These processing centers became known as the Waffenamt, the German term for a weapons control and processing organization. From 1945 until 1948, the Waffenamt in each Land was run by the Americans of the U.S. Army Ordnance Department. The German police had previously been organized and administrated on a national level. To avoid the dangers associated with a nationally controlled police force, American policy mandated that the police be re-organized on a local level, and modeled on American law enforcement. This met resistance from the Germans, because decentralized police forces required over 200 agencies, each with its own infrastructure and management, training and equipment requirements, etc. The Germans considered this a wasteful duplication of manpower, resources, and finances. Hence, the five Offices of Military Government (OMGs) were forced to negotiate with the local Land public officials on the best way to accomplish the goal of rebuilding the German police. The subsequent compromises, between what was mandated and what was practical and feasible, resulted in each Land having somewhat different policies and procedures. Cities (Städte) and counties (Kreise) with a population of 5000 or more were to form their own police agencies. The police administration and officers were subservient to the local elected public officials in the area they served. These elected public officials were responsible for providing personnel, training, equipment, funding, and other necessities for their police force. Rural towns and counties with a population under 5000 were the responsibility of the respective State (Land). The Americans referred to the Land police agency (the Landpolizei) as the Rural Police. Historically, the German equivalent to a rural police had been the Gendarmerie. However, the Gendarmerie had been disbanded at the time of the surrender. Border police, forest police, railway police, and others were separate forces subservient to the public administrators of the agency which they served. 1. The German police should be armed as speedily as possible in order that it may be able to take an active part in the maintenance of law and order. It should be re-armed under the following conditions. a. It should not have completely automatic weapons or any weapons other than pistols, revolvers and truncheons, with the exception of the rural police and the frontier control police who may be issued with carbines. b. The re-arming of the German police shall be carried out by the issue of fire-arms manufactured outside Germany in order to facilitate the control of fire-arms and munitions in German hands, and eliminate any justification for the continuance of German manufacture of fire-arms or munitions. c. All weapons issued to the German police shall be distinctively marked in order to facilitate control of same. d. No police services shall be re-armed before de-nazification and removal of all personnel hostile to the military government of Germany. Moreover, the police personnel will not be re-armed until after they have been trained in their duties. Before issue of arms a Public Safety officer shall guarantee and certify the efficiency of the training and the competence thereof justifying such rearmament. Control will be established over the procurement and distribution of police fire-arms and ammunition by means of requiring written accountability from each police agency. The loss of any weapon must be immediately reported to Military Government by the German police in writing. 2. Pending the supply and issue of fire-arms of non-German manufacture the German police may be issued with any suitable weapon in the absence of those specified in para. 1 (b) above. Issuing distinctively marked non-German weapons was fairly simple, and planning for de-nazification and police training had been done before the war ended. However, implementing that plan, given the chaotic circumstances in the months after the war, was anything but simple. Necessity had demanded that 22,000 officers be put in place before de-nazification. Purging the Nazis from these ranks was going to take months. In February 1946, the German police forces were deemed sufficiently organized, trained, and operating effectively. This allowed the U.S. Office of Military Government (OMGUS) to assume the role of overseer, while turning law enforcement operations over to the various German police agencies. Allied Control Council Directive 16 ordered that the weapons be distinctively marked, but had not specified the markings, nor where they should be placed. In the American Occupation Zone, the markings and location were left up to each of the five Land Offices of Military Government (OMG). The result was five different sets of markings and locations. The markings specified by each OMG were only a minimum requirement. In March 1946, the weapons were marked accordingly, then transported by the U.S. Public Safety Officers to each of the agencies within their jurisdiction. 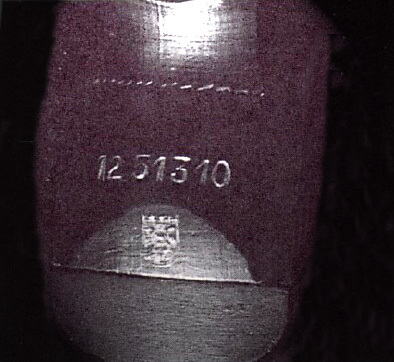 Once a carbine, pistol, or revolver was delivered to the police agency, that agency could add additional markings as desired, including the stamping of digits from the serial number on various parts of the carbine. Further markings will be covered on the pages devoted to the different Lands and their police agencies. The type of police agency, in English, was marked on top left rail of the receiver (to the left of the bolt). The Berlin star was marked on top of the receiver rear sight platform, forward of the rear sight. Example at right has been recreated digitally. No additional markings were used. The U.S. manufacturer's name and serial number were ground off and replaced with the Hessen crest on the rear bevel of the receiver. On this example, a replacement serial number was stamped on the receiver. LP if the Landpolizei (Rural Police), followed by the inventory number assigned by the Landespolizei. S if a StadtKreis (greater metropolitan area), then a 3 or 4 letter Stadtkreis identifier. Württemberg-Baden had 7 Stadtkreise and 28 LandKreise (rural counties). The term Stadtkreis was peculiar to only the State/Land of Württemberg-Baden, and is no longer used. Initial training in the operation, use, and maintenance of the weapons was provided to designated trainers in each police force by the American OMG Public Safety Officers. All further training was conducted by these designated trainers. Between 1945 and 1949, it was the responsibility of each police agency to inventory, maintain, and service its own weapons. With the formation of the West German government in May 1949, all control of the weapons was turned over to the new German government of each Land (State), which now had its own Waffenamt (Ordnance Department) to assume responsibility for the weapons. Eventual disposition of the weapons was at the Land level and will be discussed on the pages devoted to each Land.